Rebecca, the German knitting magazine, offers free patterns online. This is great because Rebecca, while available, is not common. In order to carry the magazine, yarn stores have to stock the yarn they specify, the German brand GGH. It is also great because I need to be saved from myself. I am a little frightened at the thought of adding more patterns to my collection that includes every Vogue Knitting since its premiere as a periodical in 1987, every Knitters since issue 28, and almost every Interweave Knits since Fall 1996. Not to mention over 100 books. Yes, I have an entire room in my house devoted to knitting. I love jacket patterns. I think warm coats and jackets are one of the most useful things you can knit. So I was pleased to find this pattern on the Rebecca site. I also found some vintage yarn online called Reynolds Jarelle, a thick boucle blend of wool and nylon. I got an acceptable gauge of 3.25 stitches to the inch, but I had to use relatively small needles, #6 U.S. 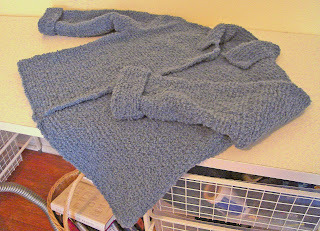 The resulting jacket is warm and cozy. Because I think that button holes can distort the smooth line of a knitted garment, I skipped the buttons and used snap fasteners. But I bravely sliced and embroidered one buttonhole at the neck and put on a big beautiful button for decoration. I love, love, love the finished product. In a few recent posts I have been bitching and moaning about the design flaws of some knitting patterns. Well, I found no flaws here. I would need to knit more Rebecca patterns to confirm this, but I suspect the fit of European patterns to be more precise than that of American designs. That is certainly the case with their ready made clothes. They tend to run small compared with their American counterparts. That is a good thing in a knitting pattern where there is a lot of give. This way you don't end up with swimming arm holes or flapping sleeves. I am beginning to pay more attention to the significance of finished measurements. I knit Jarelle in the Spring of 2006. A year later I saw the yarn that had been specified for the pattern on sale at Jimmy Beans Wool. It is Relax by GGH, a boucle blend of alpaca, wool, nylon, and acrylic, knit on a #10 needle. (They still have 3 colors left at $4.99, marked down from $10.50.) This yarn is very soft and thinner than the Reynolds Jarelle, so the resulting jacket is suitable for wearing outdoors in not- too- cold weather and can also be used indoors. 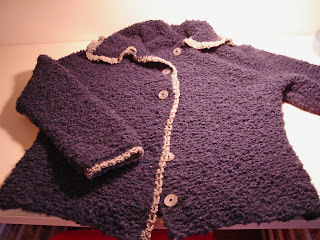 I used navy blue, and to make it different from Jarelle, I used a grey crochet trim and grey buttons. I love this sweater as well, but I find it hard to mix navy into my wardrobe which is mostly black and brown. I like black and navy together, but it is not my first choice combination, and navies vary so much that they don't mix well in my opinion. Plus the style of this sweater is too cutsey to look good with black. All in all, very happy with this sweater design except I am afraid to wash them because they are knit in all garter stitch. What do you think? Should I dry clean?